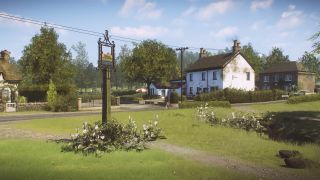 Playstation 4 exclusive Everybody's Gone to the Rapture has been receiving rapturous praise recently (pun intended, oh yeah, deal with it), partly because of its intriguing storytelling and partly because it's managed to hit the "quaint English countryside village" nail on the head. We've seen a lot of games that capture a feeling, a location or a story perfectly - think GTA 5's Los Santos and the eerie feeling you get visiting LA, like you should be punching strangers in the head and stealing their cars - but rarely has a game ever taken a proper look at England outside of stupid, boring, grimy London. I'm tired of London, really. Samuel Johnson is often quoted in these stages of London lethargy - "When a man is tired of London, he is tired of life." Oh, bugger off, Johnson. You didn't have to deal with drunken, kebab-wielding students, knife crime and the smoggy suffocation of the underground on a hot day, so yes, we're all allowed to be tired of London. Maybe it was really nice in the mid 1700s. To see a game that looks a little further afield than London is literally a breath of fresh air. Very few people grow up in the capital, they just end up there after a few years of desperately hoping to live somewhere that doesn't require maps to navigate. So your Assassin's Creed Syndicates, your Dishonoreds and your, er, Mario and Sonic at the Olympic Gameses - there's no sense of nostalgia there, just awe and familiarity in the same way anyone who looks at a good drawing of a duck will say "Aha, that is a duck. Very nice." It's harder to capture childhood in the way Everybody's Gone to the Rapture has. London is too big, means too many things, has too many parts. The quintessential British village has the same features, no matter where it is in our lovely country. Village greens festooned with shabby bunting; sleepy sun-dappled roads winding around unkempt bracken and grizzled oak trees; fancy lamp-posts that stand tall outside fancy gastropubs owned by a plump local family. Even just looking at screenshots, you can almost feel the hazy summer heat filtering down through the leaves, and smell the waft of manure from the farm. Everybody's Gone to the Rapture gets it all so spot-on with its tiny little details that it's a wonder no one has tried to do it before - they make it look so easy. And with as many British video game studios as there are, why hasn't it been tried before? Video games are, more than ever, becoming about nailing verisimilitude, and if we can get craggy faces and Lara Croft's ponytail to be more lifelike than ever, then why not the places we live and grow up? Basically, what I'm saying is I want the next GTA to be set in The Midlands. IS THAT SO MUCH TO ASK! ?